The short story dominates Argentine literature. These stories often are not based in realism but in a fantastical realm that examines the meaning of identity and mortality. Borges is the writer that most often comes to mind. But before Borges there was Horacio Quiroga (1878-1937), who unfortunately rests in obscurity (at least among non-Spanish readers). Though born in Uruguay Quiroga can still be considered an Argentine writer. After traveling to Paris he turned to Buenos Aires where he was active in the city’s vibrant literary scene during the early 20th century . Quiroga lived a life that was as dark as his own stories. Surrounded by death and violence, his father died suddenly when he was young. Barely into his twenties, Quiroga himself accidentally shot and killed his own friend. Quiroga’s first wife committed suicide when he was thirty-seven. It was after her death that Quiroga entered his greatest period of story writing. In 1917 he published Cuentos de amor de locura y de muerte. Two years later he published Cuentos de la selva, a set of stories for children, which are still popular today. In 1937 Quiroga learned that he had cancer and chose suicide himself, ending his own life by swallowing cyanide. It also is possible to purchase Cuentos de amor, de locura y de muerte in Spanish from Amazon if you’re in the US or elsewhere. Of course, in Argentina, Quiroga is pretty easy to find in Spanish. Quiroga was also known as a good craftsman with his hands, an experienced carpenter who built his own house in Misiones. 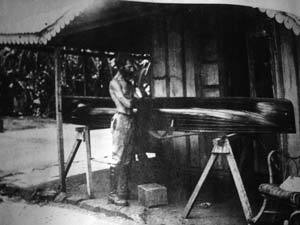 The photo (from the Archivo General de la Nacion) shows him working on a canoe. The house, located in San Ignacio near the Jesuit missions, is now a museum. In addition to writing, Quiroga was an accomplished photographer who was among the first to visually document the now famous Jesuit missions. December 31, 1878 ”“ the date of Quiroga’s birth. So, as you toast the new year tonight, remember a good cheer for the tormented life of a man who captured his despair in prose. Over the past couple of days I’ve been casting about for a book to read and then realized that today, December 28, would have been Manuel Puig’s seventy-third birthday. So I’ve decided to pick up Kiss of the Spider Woman (El Beso la Mujer Arana). Manuel Puig, who died in 1990 at the age of 57, is one of the few Argentine writers to achieve wide-spread international recognition, mostly for the 1985 film version of this novel. Nominated for four Academy Awards, William Hurt received an Oscar for Best Actor. After Puig’s death the novel/movie became a Broadway musical and won seven Tony awards. Puig was a child of the pampas, born in 1932 in General Villegas which sits on the western edge of Buenos Aires province. It’s fitting that Puig’s fame came from a movie since cinema formed the most significant influence on his writings. His early aspirations were actually to be a filmmaker and he moved to Rome to study cinema. His first novel Betrayed by Rita Hayworth (La Tracion de Rita Hayworth) is about the movies and people’s lives in rural Argentina. His second novel Boquitas pintadas, translated into English as Heartbreak Tango, also was about life in his hometown in the pampas. I write novels because there is something I don’t understand in reality. What I do is locate that special problem in a character and then try to understand it. That’s the genesis of all my work. Because of my unconscious defenses, I am incapable of facing the problem directly. There are obstacles that impede me from doing so. Yet I can do it through a literary character. It’s easier! And since all of my problems are rather complicated, I need an entire novel to deal with them, not a short story or a movie. It’s like a personal therapy. There is no freedom in that election. It’s not that I choose to do it, but that I’m forced to. It has to be a novel because I need a lot of space. It’s an analytical activity, not a synthetic one. Puig was fortunate in having very good English translators. Four of his less well-known novels are translated by Suzanne Jill Levine, who also has translated many works by Adolfo Bioy Casares. Personally, I think that Levine is one of the best Spanish-English literary translators around. She also was a friend of Puig and in 2001 published a biography of him, Manuel Puig and the Spider Woman. I’ve not read this biography yet but it sounds like a superb study. In a New York Times review by Mario Vargas Llosa of Levine’s biography, Vargas Llosa says about Puig, “He was a man of movies, or perhaps of visual images and fantasy, who found himself shipwrecked in literature almost by default.” It’s really a very good essay by Vargas Llosa and if you have any interest in literature then you should go read it. But I’m not yet read enough of Puig to know whether I agree or not with Vargas Llosa conclusion that “Puig’s work may be the best representative of what has been called light literature, which is emblematic of our time ”“ an undemanding, pleasing literature that has no other purpose than to entertain.” That seems a little harsh. Afterall, not everybody can be Borges or Faulkner or even Vargas Llosa. After the publication of Puig’s third novel The Buenos Aires Affair in 1973 and the rise of the military dictatorship, Puig left Argentina for the remainder of his life. Puig’s literary style is mostly dialogue, reflective of the cinema. He wasn’t afraid to incorporate popular culture and mass media into his stories. Homosexuality also was an instrumental theme in his works. I was surprised to learn that another book by Puig Eternal Curse on the Reader of these Pages actually was written by Puig in English first and then translated into Spanish as Maladicion Eterna a Quien Lea Estas Paginas. So, with that work, English-only readers have a chance to read Puig in the original and not a translation for once. The only questions of importance were those which a man asked himself. Another book that I have just finished is The Honorary Consul by Graham Greene. The novel is set in Argentina. Oddly enough, in the obscure, northern town of Corrientes on the border with Paraguay. It’s the tragicomic story of a bungled kidnapping by a group of would-be revolutionaries who intended to kidnap the American ambassador as he toured the nearby Jesuit ruins but instead ended up with a drunken British honorary consul who owns a small yerba farm. The group holds the honorary consul hostage, having to supply him with endless amounts of whisky while they wait for their demands to be met by Paraguayan dictator General Alfredo Stroessner who can’t be bothered while on a fishing vacation in Patagonia. Meanwhile, the British diplomatic corps in Buenos Aires is puzzled why no one in Argentina understands that the captive is only an “honorary” consul and not a real diplomat, the “honorable consul”. The story is told mostly from the perspective of Eduardo Plarr, a doctor in the small town who is the son of an English-Argentine marriage. The doctor’s mother spends her days in Buenos Aires shopping at Harrod’s and eating sweets at the Richmond. In the novel a pair of women’s sunglasses,worn by the honorary consul’s young wife, a former prostitute, figure prominently. Greene’s description of the sunglasses as well as the sunglasses pictured on the cover of the Vintage Classics edition remind me of the ubiquitous sunglasses that Victoria Ocampo wore in her later life, when Greene would have known her. I would like to think that Greene included the sunglasses in his novel as a small tribute to Ocampo. Nicholas Shakespeare lived in Buenos Aires in the early 1970s when his father was actually the British Consul. Nicholas Shakespeare is the author of the splendid novel The Dancer Upstairs and a massive biography of Bruce Chatwin (who wrote the 1977 travel classic In Patagonia ). Last week I went to KEL’s, an English language bookstore in Barrio Norte, to pick up some books that I’ve been wanting to read. I highly recommend J.M. Coetzee’s Disgrace , which I believe is the only 200+ page book that I’ve ever read in one afternoon. Other than Coetzee being from the southern hemisphere, he doesn’t have anything to do with Buenos Aires, so I’m not going more indepth into his works on this site. Back in graduate school, a young, intellectual woman I was courting (unsuccessfully) was visiting my apartment. Looking over my bookshelf, she said “That’s a well worn copy of To the Lighthouse . I sat up in the chair. Then looking closer at the book, she said, “But it’s not your well worn copy”, having noticed the used bookstore label inside. I slouched back down. That comment stuck with me for a long time, so whenever I thought about reading The Hours, which has three different women narrators, one of whom is the great novelist Virginia Woolf, I could never get beyond my friend’s comment. Finally, standing in KEL’s, I started to read some of the prose for myself and discovered that I really liked it. To hell with the gender of the author and characters. We’ll hunt for a third tiger now, but like the others this one too will be a form of what I dream, a structure of words, and not the flesh and bone tiger that beyond all myths paces the earth. I know these things quite well, yet nonetheless some force keeps driving me in this vague, unreasonable, and ancient quest, and I go on pursuing through the hours another tiger, the beast not found in verse. the other tiger, the one not in this poem. That translation is included in the Penguin edition of Borges’ Selected Poems , which includes the Spanish version and English translation on facing pages for easy comparison. Borges was fascinated with tigers and tigers appear throughout his works. In this poem the tiger represents the reality that the writer can never quite capture through words. According to his latest biographer, Borges wrote this poem just before his sixtieth birthday as an expression of the frustration with his own sense of failure as a writer. Yes, Clarissa thinks, it’s time for the day to be over. We throw our parties; we abandon our families to live alone in Canada; we struggle to write books that do not change the world, despite our gifts and unstinting efforts, our most extravagant hopes. We live our lives, do whatever we do, and then we sleep – it’s as simple and ordinary as that. A few jump out of windows or drown themselves or take pills; more die by accident; and most of us, the vast majority, are slowly devoured by some disease or, if we’re very fortunate, by time itself. There’s just this for consolation: an hour here or there when our lives seem, against all odds and expectations, to burst open and give us everything we’ve ever imagined, though everyone but children (and perhaps even they) knows these hours will inevitably be followed by others, far darker and more difficult. Still, we cherish the city, the morning; we hope, more than anything, for more.